To truly appreciate the history and significance of the quaint fishing villages and towering lighthouses that dot the Door peninsula of Wisconsin, begin your trip at the Door County Maritime Museum in Sturgeon Bay. The museum tells the stories of brave and industrious ship captains, lonely lighthouse keepers, tragic shipwrecks and the sea-worn fishermen who shaped the area. 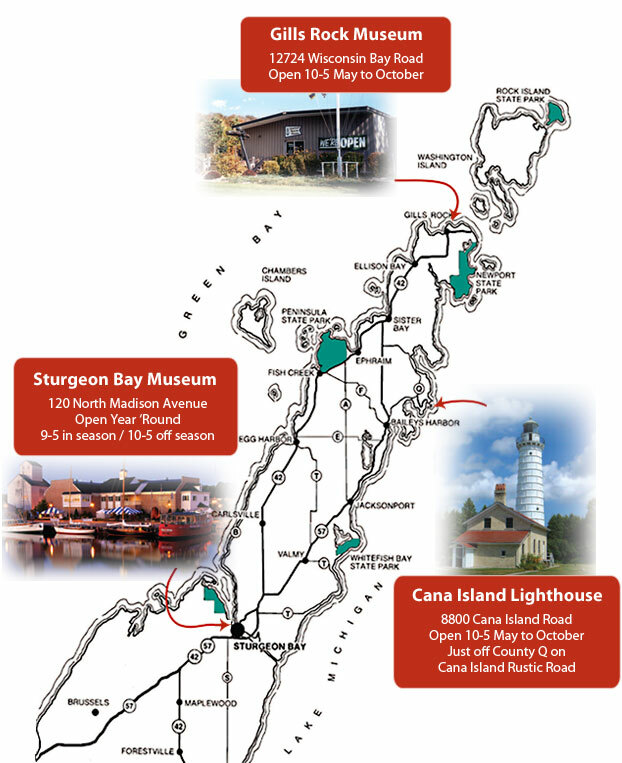 After visiting the museum in Sturgeon Bay, travel north to take in historic Cana Island Lighthouse in Baileys Harbor, which was built in 1869 and remains an active navigational aid today, and Gills Rock Museum, located at the very tip of Door County. Each of the three locations showcases important maritime elements that made Door County what it is today! Plan ahead and schedule a Group Tour, if you have a group of 15 or more.